The modern woman is a very practical woman. Just because you've been lucky enough to have someone propose to you does not mean that you should abandon all reason and go full-on bridezilla mode for your wedding day. And as you know, spending thousands of dollars for a gown that you are only going to wear once (unless you're Kim Kardashian and looking to get married twice) is not a very practical move. Why not opt for wedding gowns with an innovative design concept, such as 2 in 1 wedding dresses? 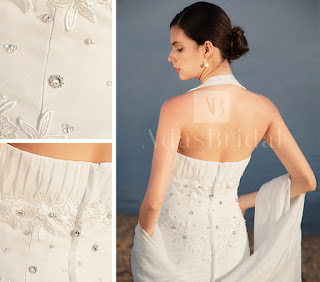 AdasBridal offers 2 in 1 wedding dresses that you can wear even after your wedding as a casual form of formal wear. This is due to the removeable train that enables you to transform the gown into something a little more simpler. Head over to AdasBridal and check out their selection of 2 in 1 dresses! They are definitely a worthy investment, in my opinion. I mean, why purchase a wedding gown that you will only wear once when you can buy one that can be incorporated into your daily wardrobe? Trust me, purchasing one of these beauties is the right decision because you'll be able to enjoy your dress for years to come as opposed to just hiding it in a trunk once you've worn it on the big day. So what are you waiting for? Start shopping for the perfect 2 in 1 gown now!